This documentary delves into the origins of the “soup of life” made by chef and essayist Yoshiko Tatsumi, which she originally created as a nourishing food for her bed-ridden father. Tatsumi, a popular TV personality (Kyo no Ryori) and writer, works with local food producers to ensure the most wholesome ingredients, and shares her wisdom and experience in popular cooking classes held at her home. Yoshiko Tatsumi was born in Kanagawa Prefecture in 1924. 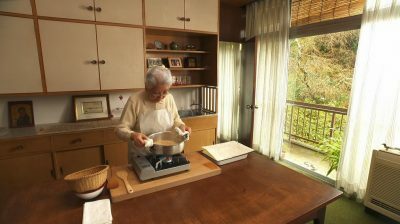 Her mother was Hamako Tatsumi, the pioneering home cooking expert. She is the author of over 40 books and winner of the 2010 NHK (Japan BroadcastingCorporation) Broadcasting and Culture Award. Please note that food and drink (water excepted) are not allowed at this event. Thank you for your cooperation. For more information about Japan Foundation, Toronto event reservation and admittance policies please have a look at our Event FAQ page.